Oh, you're going to like this one. Guaranteed. If you follow this blog, you know I'm a wing-it kind of cook. I feel more comfortable following my own instincts rather than following recipes. And I like to make use of what's in my fridge and in my pantry. Today I had my eye on the apples and apple cider we got from an apple picking excursion last month and a bag of dried bing cherries that I picked up from Trader Joes the other week. I also had fresh thyme in the fridge, a can of chicken broth in the pantry, and Courvoisier brandy in my liquor cabinet. Score. Perfect ingredients for a sauce. All I needed to do is pick up some pork chops for a perfect fall meal. Mmm. This was delicious, the pork juicy and meaty and the sauce tart and sweet. To balance off the fruit, I served the pork with sauted shredded brussel sprouts, which are slightly bitter, and pecans which I toasted in a dry skillet and then sauted with a little butter, sugar, and a splash of apple cider. Baked potatoes finished off the meal. 1) I follow the Asian way of cooking and try to incorporate the different taste sensations into my dish: sweet, sour, salty, spicy, bitter, umami. I also think about texture and color, because in addition to taste, texture and eye-appeal are important parts of eating. This dish, with the sides, is firing on all cylinders, which is what makes it so successful. 2) I have some tried and true cooking techniques. One of my favorite techniques whether it's chicken thighs, beef steak, prime rib, or pork chops, is to pat the meat dry, season it (kosher salt and pepper are often all a meat needs), sear the meat on both sides over medium-high heat on the stove top in a oven-proof pan and then stick in the oven to finish cooking. You can choose to finish your meat in the oven "dry," stew it, braise it, or cook it with a little bit of sauce which I what I did here. If you cook it dry, you can serve it dry or serve with a gravy, sauce or salsa. Perfect this technique and you can make hundreds of dishes. 3) This sauce is based on a ratio of 2 parts base (chicken broth/salty), 1 part cider/fruit juice (sweet/sour), 1/2-1 part liquor. The rest -- dried cherries, thyme -- are flavor enhancements. Cook the sauce down by half and thicken; you could add heavy cream to soften the bright flavors, but I would test the cream in a small amount of sauce to make sure it doesn't curdle (milk or half and half will likely curdle because of the acidity, although the thickener may help hold everything together -- I didn't try this, but it's a worthy experiment, don't you think?). If you follow tip #1, you would taste the sauce for balance. If it's too sweet, you'd add vinegar or lemon juice although since I used dried cherries here, they added the needed acidity. It it's too sour, you'd add more sweet (sugar, honey, etc.). Do you not want to make a sauce but a glaze? You could either simmer down this sauce until it's glaze-like, or you could just make a whole new combo based on the idea of sweet and sour. So for example, you could take equal parts honey and balsamic vinegar, add enough water or cognac so that you could plump up the dried cherries and simmer on the stove top a few minutes. You could also easily substitute the protein. Instead of using pork chops, you could use pork scallopine or cook a whole tenderloin. 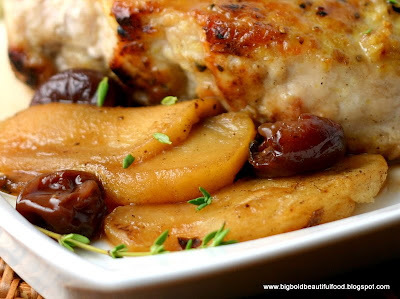 Chicken, turkey, and duck would also work well with a sweet and tangy sauce. I admit that sometimes I don't get where I want to go with my wing-it cooking, for for the most part, it really works out well. I hope you try this! Combine everything in the sauce but the cornstarch slurry, which you'll add at the end. Bring to a simmer and simmer until it's halved in volume. Dry off pork chops on both sides with paper towels. Dust generously on both sides with salt, pepper, and Bicentennial Rub (optional). Heat a large oven-proof skillet (like a 12-inch skillet) over medium-high heat. Sear pork chops on all sides until brown. When seared, set aside. In the same skillet, add a little oil and butter over medium heat. Add minced shallots and saute for a minute and then add the sliced apples. If the shallots start burning, add the apples sooner. Cook the apples until they're soft and a little browned. Add about a cup of your simmering sauce to the skillet with some of the cherries. Add back the pork on top of the apples and sauce. Stick in the oven and cook until the pork reaches an internal temperature of 149 degrees (use a thermometer and stick it into the center of the pork to check the temperature). This will take around 20-30 minutes, depending on how thick the pork is and how long you had it over heat when you browned the pork. When the pork is done, put on a platter, tent with foil, and let rest for 10 minutes. Pour the apples, cherries and sauce from the skillet to the sauce in the saucepan and stir gently. Taste and adjust seasoning. Thicken up the sauce by adding a little cornstarch slurry. Stir and when the sauce comes up to a simmer, see how thick it is. If you want it a little thicker, add more of the slurry. Pour finished sauce over pork, top with a little fresh thyme or parsley and serve. I would like this! It looks fabulous! Great tips Ninette - especially the ratios! I try to cook "on the fly" but never as creative as you! As you can tell by one of my recent posts, I love pork chops. This sounds delicious. Can't wait to try. The oven roasting method - tried and true. Just happen ot have some cherries on hand! Thanks for this. Oh Ninette what a fantastic recipe! It looks mouthwatering. I haven't made pork chops in so long, and I love the sweetness you have going on here. I also love your brussel sprouts you have on the side! FOR SURE, I will love this. With cognac? A winner already! 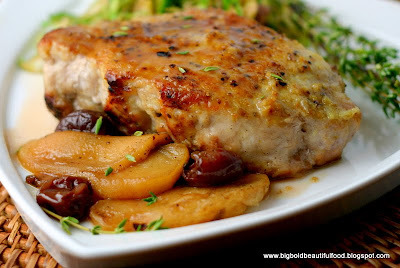 The challenge of cooking pork chops is to keep them tender and moist, and yours certainly look like they are! 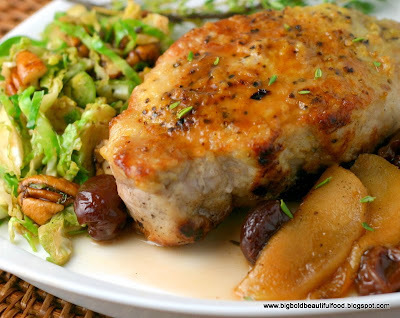 Great looking pork chops! I like that you served them with brussels sprouts. Nice meal! This was a great fall recipe, thank you. Really good flavor. I paired with the Shredded Brussel Sprouts recipe (with pecans)- and to my family's astonishment they tasted great- and to mine I think they were cooked perfectly and not over done. Instead of baked white potato, I added baked sweet potatoes. And the color of the sweet potato next to the bright green brussel sprouts was just vibrant. Hi Carrie, so glad you tried this recipe. I was really happy -- even blown away -- by the results. I think this will have to make a reappearance Thanksgiving week since I'll have family all week, although I'm going to do a tenderloin instead. What is the oven degree when you the chops in? 350 degrees is fine, Mei. I'll add that to the recipe. Thanks for pointing it out. Glad to have found your blog by watching a "dried cherry" google image. I think I'll try some recipes of yours!!! I feel more comfortable following my own instincts rather than following recipes. And I like to make use of what's in my fridge and in my pantry.